Session 421. A solid northerly came in around noon. I arrrived at Seaford at 3:00 p.m. with the wind blowing over 20 knots so I headed out on my Union 8. I was well powered but able to catch some nice bay surf. First session with shorty wetsuit and no booties - nice! The wind strength was building so I came in and changed to the lower knots to get some more wind range. It was a good think I did as the wind kept getting stronger, which of course meant the waves were getting bigger. I spotted Stu Styles on the beach with his kite downwind and went down to have a look, he was getting ready to walk back. 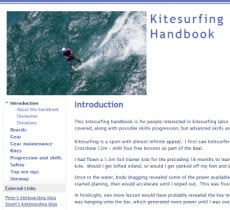 I found at after the session that he was struggling with the strong wind and had the kite high when it was yanked in a strong gust and the entire harness was dragged over his head and off him. Its the first time I have ever heard of that happening. The kite sailed into the beach with the harness providing some tension in the lines. Luckily a beach goer secured the kite when it arrived. I tacked back to our start point but as I arrived the wind got stronger again. I wasn't keen to risk trying to land the kite close to the fence so I deployed the safety and dropped it in the water then retrieved it by following the line in. Wow, I need a smaller kite. I wanted to get a 6m kite last year but they sold out, so I think I will grab one early this season. Really nice to be on the water. I took it easy in the strong wind and was glad I did.